I could write a book about the golden age of SSI (Strategic Simulations, Inc.). What a great name. If you’re at all like me, you’d just want to support a company with a name like that. There are several games I bought on the strength of that brand alone. Fortunately, I was rarely disappointed, hence the golden age. The first SSI game I played was Kampfgruppe which was way beyond my then thirteen year old mind. Shortly afterwards, I played Phantasie. That was much more my speed. 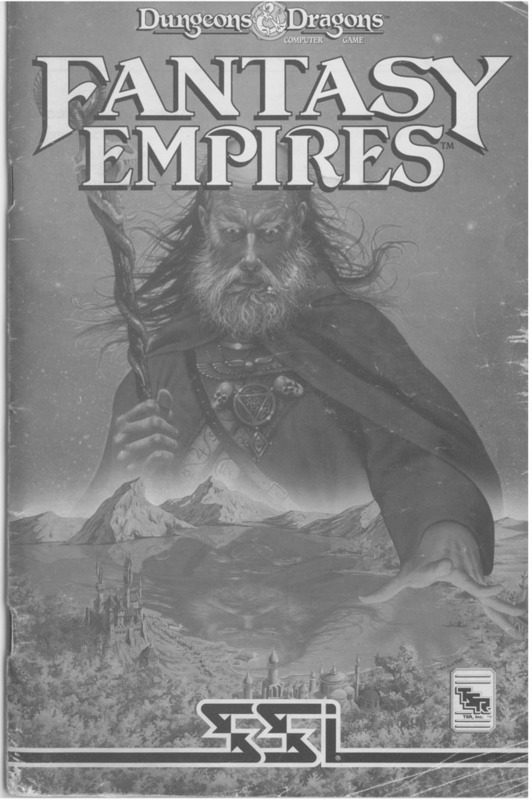 Then, I had a lot of fun with the AD&D games. Eventually, I came across a game called Cyber Empires by Silicon Knights. It was a neat mix of strategy and action set in a world of warring giant robots. Looking back, it might have been a bit shallow, but I loved it. When I heard that a sequel was coming, and that it would have the D&D license, I was ecstatic. 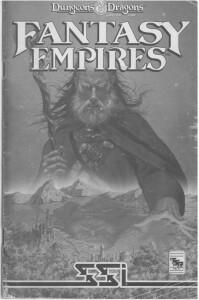 That sequel was Fantasy Empires. I played it for a long, long time. The story is wonderfully cheesy. 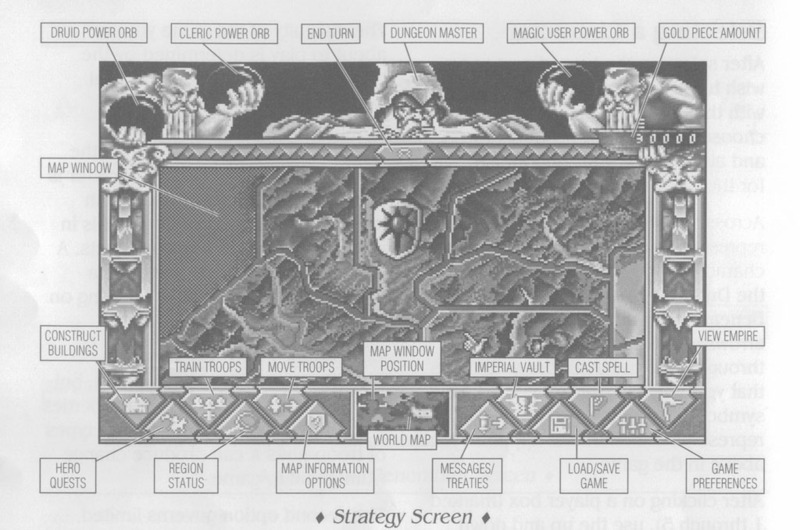 The Dungeonmaster is tasking a group of warlord challengers to battle to unite the world of Mystara. 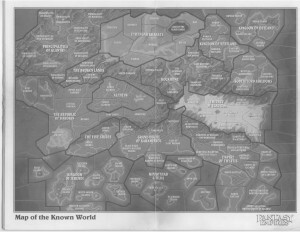 They must conquer the world one territory at a time, building their armies, magic and heroes to conquer lands, one another and eventually the world. The images are taken from my old paper manual. It’s a bit dog eared from my constant flipping through it. Sometimes I miss paper manuals. 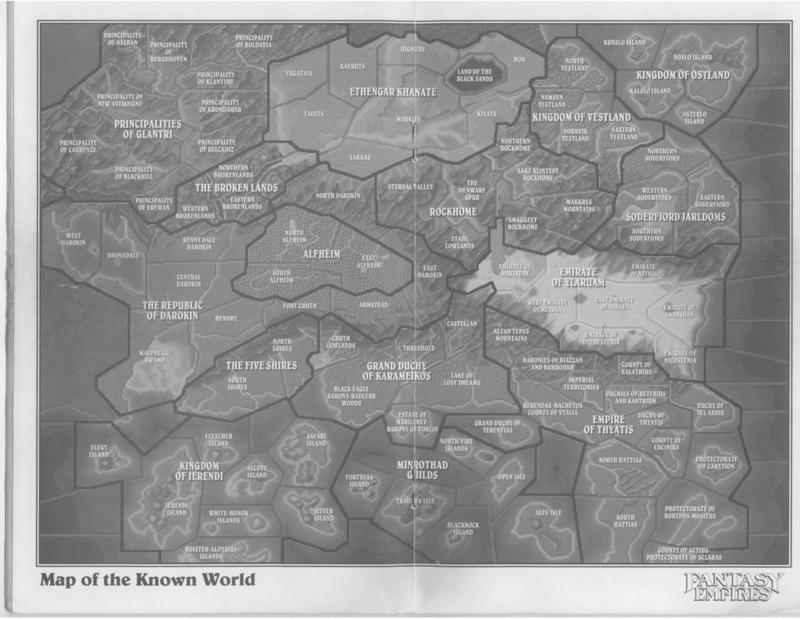 Anyway, as you can see, most of the screen is dominated by the scrollable world map. That’s the Dungeonmaster on top. He has some neat animations that add to the game. There are three orbs representing your current levels of Druid, Cleric and Magic User power respectively. Those allow you to cast spells that affect an entire region. Below the orbs is your gold piece total. You’ll spend that quickly building your empire. 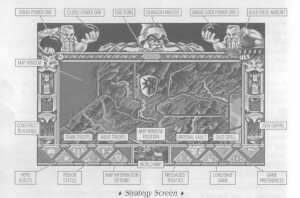 In the middle, below the Dungeonmaster, is the end turn button. Across the bottom are the buttons you’ll use to build and manage your empire all framing the minimap. Here’s what you can build in the game: Keeps, castles, armories, temples, towers, armies (dwarves, elves, shadow elves, halflings, undead, orc and human fighters), heroes (elves, magic users, clerics, druids, fighters, and dwarves) and siege weapons (catapult, ballista and battering rams). You’ll need nearly all of them to conquer the world. Heroes, in some way, are the heart of the game. They start off weak, but through battles and quests, they can grow quite powerful. This is important in combat section of the game. In combat, Fantasy Empires doesn’t give you tactical control of your troops like Total War. No, you’re launched into a massive game of Gauntlet based on the units you brought to battle. You do have the opportunity to set your battle lines before the battle as well as cast spells if your heroes have the ability. You’ll have direct control of one of your units, usually the most powerful hero you brought to the battle. You can also take control of any other unit on your side, but this leaves your heroes vulnerable so it’s often best just to use the hero leadership ability to maneuver troops around the battlefield. Your hero only has attack and block buttons, but they’re quite powerful and can turn a close battle. Castles and siege weapons add a bit more depth to these action oriented affairs. The attacker can’t win without taking the castle. To do that they’ll need to breach the walls either through magic or sheer force. The magic can be through a global spell like earthquake or your magic users fireball attack. Force is your catapults breaking down the walls or your battering rams breaking through the gate. There’s just enough control to make you feel like you always have something important to do in a battle. After the battle, heroes gain experience and regular troops can gain veterancy. Between battles heroes go on quests. Many times they die on those quests. If they return, they come back stronger and may bring magical loot. Some of it is equipment for them. Others are might magical items stored in your vault to increase your power. Most of these allow extra uses of global spell without draining your mana. Some have other game changing powers.